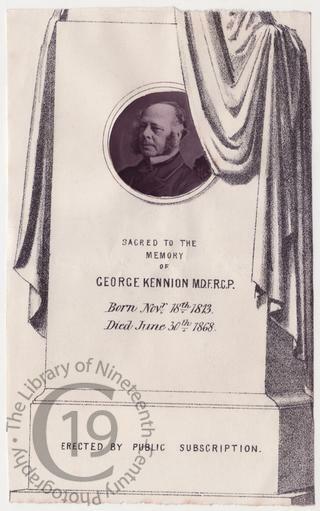 A small albumen print portrait pasted on a pre-printed piece of paper the size of a standard carte-de-visite, this memorial card was produced to mark the death of George Kennion MD and FRCP, who in 1858 published Observations on the Medical Springs of Harrogate. Born on 18 November 1813, he died on 30 June 1868. His son George Wyndham Kennion (1845-1922) was the second Anglican bishop of Adelaide in South Australia from 1882 to 1894. From 1894 to 1917 he was the bishop of Bath and Wells.